1770 LARC! Tours specialise in catering for custom group tours from schools, to coach groups or even corporate programs. Our team love the challenge of creating that something different for your specialised group. We are very open to catering your every needs. Years of experience with catering for schools, coach and corporate groups 1770 LARC! Tours welcome your enquiry. From 5 year old’s to University students 1770 LARC! Tours can cater your school lesson to meet individual schools requirements. Reward the kids with their end of year camp on the LARC! Our knowledgeable tour guides can tailor their spiel towards the class needs for that group. Imagine Biology class from the back of our pink LARC! Tailor and customise an experience with 1770 LARC! Tours on the picturise Bustard Bay. Take your guests on a unique experience that they will never forget. Seal that deal on a secluded beach with no distractions or create a new working partnership through a team building day out. 1770 LARC! Tours specialise in creating experience for your business to do business! Tailor a charted 5 hour Sand Boarding Safari for special occasions. School groups, Birthdays, Bucks and Hens do or just keen as bean Sand Boarding families. 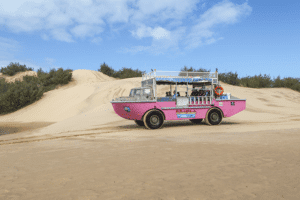 This fully catered tour is all about adventure and getting down and dirty on the towering sand dunes of Middle Island. Our famous sand hills can cater to any level of Sand Boarder from expert to beginner. Twitchers unite! Charter a LARC! to reach unexplored stretches of Natural Park and Nature Reserves completely remote to “normal” vehicles. The isolation gives our bird watching guests the unique opportunity to view endangered and rare birds of the Southern Great Barrier Reef Region. With very experienced bird watching specific tour guides on hand, we highly rate our bird watching experience!